The rule of making a hat is still the same today as it was one hundred or two hundred years ago. The opposite clan made the hat. When the hat got through at a party [i.e., after a ku.éex’, or potlatch], then the people who owned the hat hired the opposite clan to weave those bobs on it. And it just keeps going. The rule is still in place. Woven spruce-root hats are among the most sacred at.óow (crest objects). A clan leader wears one at a ku.éex’, or memorial potlatch, and the hat is displayed at his own wake and passed on to his successor. Hats also symbolize exchange between the two halves of Tlingit society; each time one is displayed the owners must make a payment to their “opposites” who are guests at the ceremony. 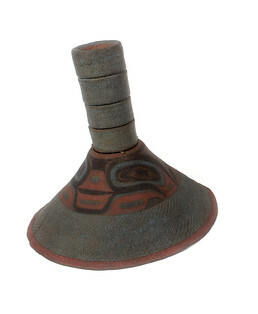 These opposites – whether Raven or Eagle – were the original makers of the hat and, after each ku.éex’ will add a new woven cylinder to the top for its owners. Teri Rofkar: There are broken spruce roots in here [inside the top potlatch rings] where the ermine was attached [at the top]. Yeah, there was an ermine skin, at least one of them hanging out of the top of here . . . I thought I saw something up here on the formline [the pattern in the middle of hat], but I think it’s just where the paint has rubbed of, not where it was a different pattern. So interesting. The secondary is pretty much faded away so you can hardly see it. But, there’re some great blank spot in here [in the painted pattern on the hat] . . . btween the red and the black there are blank spots where there’s just roots that’s all faded, you just can’t see it anymore and it was also here in this U shape [in the lower part of the pattern]. It is really nice. Shelly Laws: What was that there? Would it have been white? Teri Rofkar: Yeah, it would have been clear line, yeah, definitely. The three strand [weaving on middle part of hat] is really nice. Teri Rofkar: On the inside was the headband that holds it firmly on your head while you’re dancing. That head band joins right here [the small ridge in middle of hat]. So, what happens is you’re weaving along you’re always having to add more warps . . . hundreds and hundreds of them. So, if you’re adding every other one and you’ve got like three hundred of them, you know that you have one hundred fifty of them to add. So we can count on the headband, if you look in there the weaving is much bigger then what you see here [on the outside]. And what they did was they wove it and the warps in this headband that’s only about, maybe an inch long under there and they wove it and it had long warps on it so when they put it in [on the inside of the hat] those warps become the edge. And many times this [edge band] is a four strand braid. So, this [middle] is all three strand weaving, so you’ve got three weft elements . . . it gives it that really smooth beautiful texture to paint on. And then the headband, and I switch to this skip-stitch, all rough like the skin on the back of a frog. Yeah, so I was looking underneath to see, also to see if this one had this kinda crossed warps at the top, but it did not. Aron Crowell: And that same switch of pattern you also see on the Sugpiaq hats? Teri Rofkar: Yes, yeah there’s gotta be some relations there. And you know the spruce has only been up this way, not that long. Audience: This band right here [center of the green band] looks different to my eyes. Teri Rofkar: Oh the center one? That’s because of the angle of my weaving. It just goes right in one way and it is fighting itself and then it goes right into the other. So, this is that zigzag and it is because of the angle of my weave it interacts differently with line element and looks different. Very good eye. I find it interesting that these [potlatch rings] – yeah, they should be all three strand. Look at how big they are in between, I mean like huge. Compared to the size because you aren’t gonna see that so it is no big deal. And that’s what I wanted to look at on the top , did this one have a ermine skins on it when it came in?